Although I’ve only made them a few times, Sugar Cookies with Royal Icing are one of my very favorite things to make for a party, especially a party that has a theme. 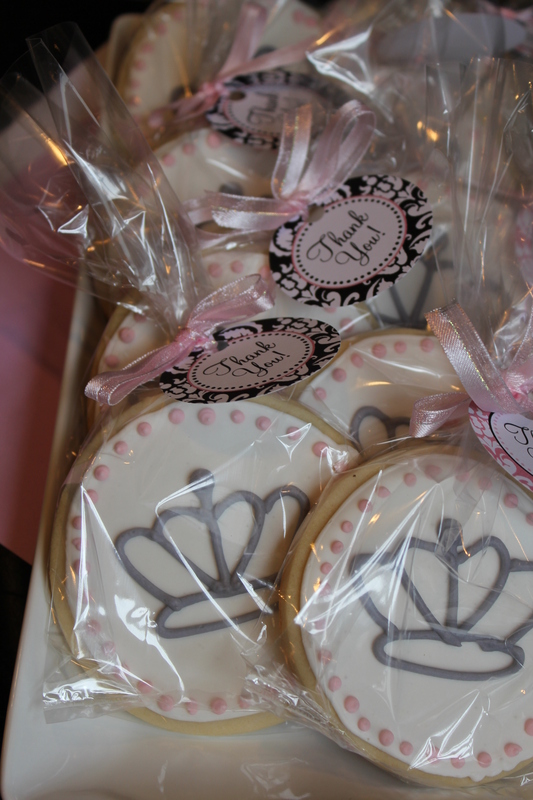 This past weekend we celebrated my future sister-in-law’s last night of single-dom and these cookies were the perfect “thank you” treat for her bachelorette party. 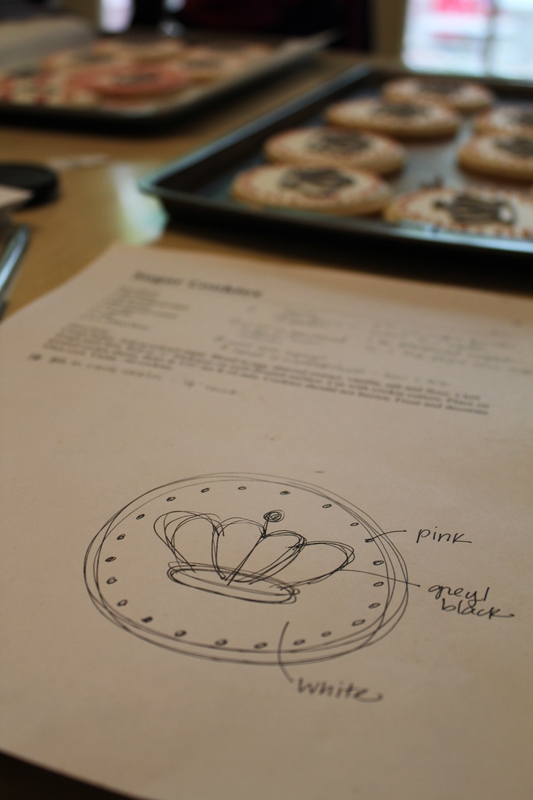 What I love most about using royal icing is that you can create a cookie to match any theme. These went right along with our sign and door decorations. I set them out as favors at the dinner table and they definitely received many “ohhs” and “ahhs”. Some of us finished the whole cookie and some of us just ate half to save the rest for later. Unfortunately these cookies don’t hold up well at the bottom of your purse after a night out at the bars but I will say that the crumbs do taste delicious. Instead of just posting the recipe I thought I’d walk you through my journey of making sugar cookies so that you can start making your own. I learned how to decorate with royal icing from Annie’s excellent post and have used this method every time I decorate with royal icing. I typically use her standard recipe but have also used her recipes for sugar cookies, revisited and enjoy them just as much. It basically just depends on what kind of mood I’m in and what ingredients I have on hand at the time. I use Bake at 350’s recipe for royal icing as she also has great pictures. There is a delicate balance required in getting the royal icing to the exact right consistency and her photos demonstrate the process very well. Choose a theme. Since we were using a grown-up version of the Vintage Princess Theme for our banner and signs I wanted to do something that incorporated this theme into the cookies. First, I decided I would do a circle shape (It’s an easy shape and I already had a circle cookie cutter). Next, I drew out a rough sketch of what I wanted the design to look like and labeled each part with the color it would be. This helps a lot when you’ve got a ton of white icing that needs to be divided so that you have an idea of how much you’ll need. Bake your cookies. I use the recipes mentioned above but you could use any you like. I almost always bake them the night before so that I can be sure they are cool for decorating. They keep well stored in an airtight container for at least a week so I don’t worry about adding an extra day to the process. Make your icing. This can also be done the day before you decorate but I almost always do it the day I decorate. Decorate your cookies. Annie’s post mentioned above has excellent step-by-step photos that may the process look extremely easy. Bake at 350, also mentioned above, has a number of great tutorials, as well. Package your cookies. I usually buy clear plastic goodie bags from Michael’s and print out tags for them but there are many, many creative ways to package them and they hold up well once the icing is set so be creative! And last but not least, make sure to walk arm-in-arm with your bachelorette. Another great, useful post. Thanks for sharing!